When people are looking for wedding services and planners they will turn to the internet and largely to Google. Every month Google processes 110,000 searches for the term ‘wedding planner’ with a further 60,500 searches for ‘wedding venues’ also made. 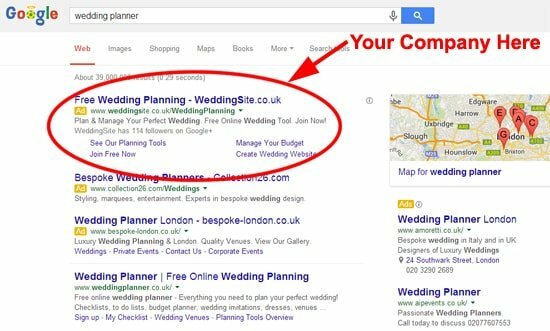 In addition to this there are 49,500 and 6,600 searches for ‘weddings’ and ‘wedding planner checklist’ respectively, this demonstrates the potential client base that Google and pay per click marketing can provide your company with. Here at Trafiki we have a fully qualified Google AdWords team and are official Google Partners. As part of this partnership we have access to tools which help us determine what people are searching for. The image below shows this tool in action and with our help we can help them find you. Pay Per Click advertising through systems like Google AdWords is a very efficient way of generating new business and with our help you can be ahead of your competitors and start earning today. Google currently owns 84% of the UK search engine market share and deals with a staggering 5,922,000,000 searches a day! Potential new customers in search of wedding planners and services are using Google rather than outdated methods such as the Yellow pages or magazines to look for companies. If Pay Per click advertising is not managed properly then it can become expensive and ineffective. Our qualified AdWords team will be able to make the most of your money and make sure that the correct people who want your services are looking at your site and giving you their business. As we are qualified Google Partners we are able to offer you £150 worth of free Google AdWords vouchers to any new clients who use our services. If you already have a Google AdWords account then we are able to offer a FREE no obligation AdWords account audit worth £200. This will help you get better quality scores and lower costs per click. Many people who try to do AdWords on their own or in-house do not fully understand how it works and may be gaining the full benefits that can be achieved with our help.